With motherhood comes a lot of joy, a bundle of responsibilities, and some initial discomfort as well. Pee Safe disposable breast pads address one of those discomforts and help you stay dry when you are not feeding. To avoid leakage, it draws milk away from the skin into the pad. It is a must-have for every new mother. It becomes one with the body, which means it is not visible once you are dressed. The wetness is absorbed instantly by the dry top layer and any milk leakage is prevented by the breathable waterproof tissue. Comfortable and discreet, these disposable breast pads are specially designed to help you stay dry and comfortable. So, what are you waiting for? Get this product right away and keep all your worries at bay! About the Brand: PeeSafe is a product of parent company Redcliffe Hygiene Pvt. Ltd. The brand 'PEE SAFE' aims at manufacturing personal hygiene products for women to keep them safe, clean and healthy. Explore the entire range of Breast Feeding available on Nykaa. 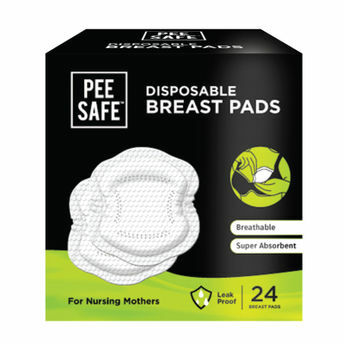 Shop more Pee Safe products here.You can browse through the complete world of Pee Safe Breast Feeding .